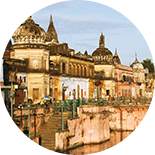 Uttar Pradesh, the state in the Northern India has a glorious history that dates back to 4000 years. It was the Aryans who laid the foundation of their civilization in the area. The epics of Ramayana, Puranas and Mahabharata were written in the same era. 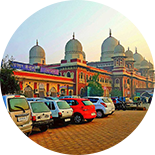 Uttar Pradesh reached the peak of prosperity during the Mughal rule and the Mughal influence is still present in many areas of the state. Besides being a region of historical significance, Uttar Pradesh is a land of surprises. It is a beautiful mix of contemporary and rural life. Travellers from all over the globe visit Uttar Pradesh to learn more about its fascinating history and get a glimpse of the centuries old monuments. Uttar Pradesh has also been home to dancers, poets, artists, politicians, philosophers, musicians and academics. Every city in Uttar Pradesh has a distinguished story that locals of proud of and travellers are mesmerised after listening to. 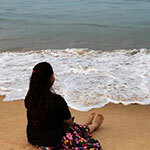 Some of the cities that must be in your Uttar Pradesh travel itinerary are Agra, Lucknow, Varanasi, Allahabad, Kanpur, Jhansi, Mathura, Ayodhya, Kushinagar, Shravasti and Vrindavan. 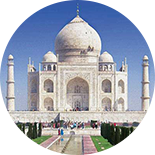 Travellers must visit Agra for Taj Mahal. Fatehpur Sikri and mosques with beautiful architecture Lucknow for British Raj-era buildings, Mughlai Food, Bara and chotta imambara, and chikankari handicrafts. Mathura and Vrindavan for temples. Varanasi for temples as old as 500-1000 years and world-famous Banarasi sarees Taj Mahal in Agra, a UNESCO World Heritage Site and one of the eight wonders of the world is the symbol of love of Shah Jahan for his wife Mumtaz. The ivory white-marble mausoleum was built by 20,000 artisans and is regarded as one of the best masterpieces of the Mughal architecture. Another World Heritage Site in Agra, the Agra fort is a walled palatial city. It has many impressive structures inside such as the Khas Mahal, Sheesh Mahal, Jahangir Mahal, Moti Masjid and Diwan-e-khas. Onlookers are often mesmerised by the stately aura and colossal dimensions of the Agra fort. One of the fortified areas on the hill in the city of Jhansi, the Jhansi fort has some of the remnants of Sepoy mutiny. The fort has also stores supplies of magazine and treasure. 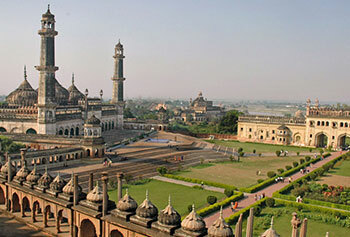 Bara Imambara in Lucknow is claimed to be one of the largest unsupported structures in the world. An engineering marvel and a fine example of Mughal architecture, Bara Imambara in Lucknow is made of Lakhanui bricks and no wood or metal was used in the construction. 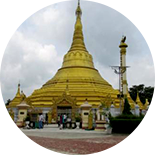 It was primarily famous for the incredible maze called Bhul Bhulaiya on the upper floor of the monument. 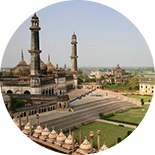 Allahabad Fort is constructed on the Northern banks of Yamuna and is one of the major attractions. Built in 1583, the fort has massive walls and three gateways. The Ashoka Pillar is the most interesting structure in the fort. Uttar Pradesh is a must-visit state for wildlife enthusiasts. 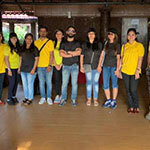 Some of the animals in the wild life sanctuaries including Dudhwa Reserve Park, Ranipur Sanctuary, and Chandra Prabha wildlife sanctuary are rare to find elsewhere. If you want to see Gangetic dolphins, head to the National Chambal Sanctuary, which is a tri-state protected area. Uttar Pradesh has abundant natural resources and you will find several species of trees, mammals, insects and reptiles in temperate upper mountainous forests belts. The birds that are commonly found are doves, songbirds, comb ducks, parrots, house sparrows, peafowl, kingfishers, parakeets, quails and snipes. The commonly found animals include lizards, gharials and cobras. Trout and mahaseer are the most common fishes. 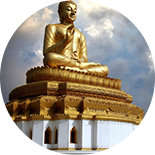 Looking from religious point-of-view, Uttar Pradesh has numerous well-known pilgrimages. 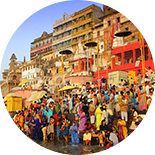 Kashi Vishwanath is one of the most famous temples dedicated to Lord Shiva. Constructed on the western bank of Ganga in Varanasi, the temple is one of the twelve Jyotirlingas. It is believed that lord Shiva blows the mantra of salvation in ears of those who get a natural death in the temple. One of the prominent attractions in Varanasi, Assi Ghat got its name from its location at the confluence of Assi and Ganga river. 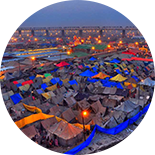 Sangam is a holy place where the three rivers - the Ganga, Yamuna and Saraswati meet. Thousands of people visit this famed holy place in Allahabad every year. A beautiful edifice in white, the ISKCON Temple in Vrindavan is made of marble. Also called as the Krishna Balaram Mandir, it was the first built by the ISKCON community. The grand temple is an architectural wonder with intricately carved walls, winding peacock stairways and use of beautiful stones on ceilings and walls. 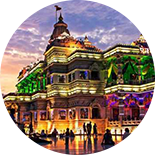 The birthplace of lord Krishna, Shri Krishna Janmabhoomi is in Mathura. The place is always filled with the devotees of Krishna and Radha. Hanuman garhi is said to be the residence of lord Hanuman. It is the most important shrine in Ayodhya. Festivity is always in air in Uttar Pradesh. More than 2,250 fairs and festivals celebrated every year in the state are examples of true communal harmony. The true secular spirit of Uttar Pradesh is reflected when these events and occasions are celebrated with a lot of grandeur. Some of the popular festivals are Taj Festival, Barsana Holi, Maha Shivratri in Varanasi, Diwali Festival, Lucknow Mahotsav and Kumbh Mela. Like any other North Indian thali, the typical meal has roti, dal, sabji, rice, raita and papad. The festive thali has sabji, puri, kachauri, pulav, raita, papad, salad and desserts. Besides the typical, traditional vegetarian meal, different communities in Uttar Pradesh have particular cuisine. The Awadhi cuisine from Lucknow for instance is famous for nihari, kebab, biryani and keema. One must try Bedhai, which is a famous dish in areas of Mathura and Agra. Pedha - a sweet delicacy of Mathura and Vrindavan. Petha - a pumpkin delicacy of Agra, and Bedmi Poori - a deep fried puri stuffed with masala and urad dal. Uttar Pradesh is a shopper’s paradise, especially when it comes to fabrics. Agra is famous for embroidered items and Varanasi is a great place to shop for beautiful banarasi sarees at an affordable price. Buy chikankari clothes from Lucknow. If you are looking for brassware and bronzes, Moradabad is known all over the world for impressive products. There are three distinct seasons in Uttar Pradesh - winter from October to February, summer from March to Mid-June and monsoon from March to September. Though the climate is basically tropical monsoon, there could be variations because of different altitudes. The temperature varies from 3-4 degree Celsius in January to 43-45 degree Celsius in May and June. The best time to visit Uttar Pradesh is between October to March, but you can major most of the major cities any time of the year. 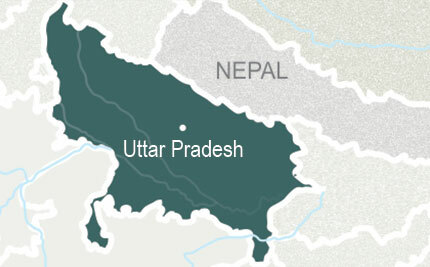 Uttar Pradesh has a mix of cultural and religious influence. While most of the people migrated from different parts of the country and had different religions, they recreated their native culture. As a result, a variety of languages are spoken in the state including - Hindi, Bhojpuri, Urdu, English, Awadhi, Bundelkhandi, and Braj. 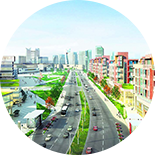 Uttar Pradesh is well-connected via rail, road and air. If you are planning a trip to this wonderful state, we can assist you further. Our team will be happy to design customized packages to ensure you have a wonderful experience. 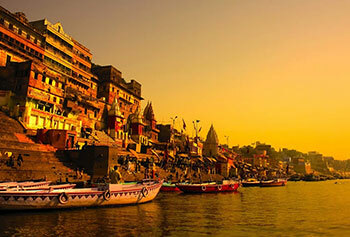 Varanasi or Kashi is one of the world’s oldest colonies and holiest cities of India according to Hinduism..